Highland’s Johnny Martin (2) looks over his shoulder at Burlington Township’s Xavier Morgan. Through six games, the Burlington Township football team had recorded six convincing wins. Only one team had finished within 20 points of the Falcons. But on Saturday afternoon, the Falcons' closest victory was by far its biggest statement of the season. 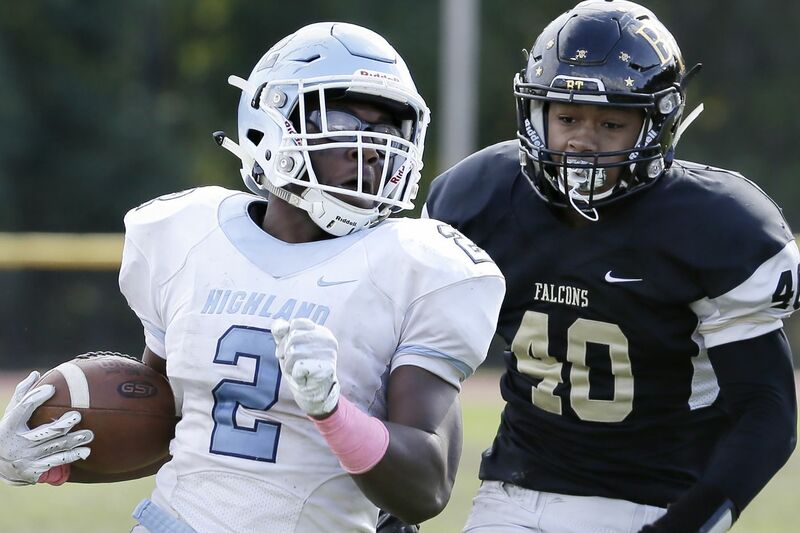 In a battle of undefeated teams, Burlington Township edged visiting Highland, 14-13, clinching a share of the West Jersey Football Liberty Division title. "It was fun game. I don't care what side you're on," said Falcons coach Tom Maderia. "This was a 15-round fight. And in the 15th round we happened to make a couple more plays than they did." The teams featured totally opposing styles. Burlington Township, ranked No. 6 in the Inquirer Top 25, relied on its big-play ability. Its two scores were a 77-yard touchdown reception by Justin Johnson on the game's opening drive and a 60-yard touchdown run by Rodney Vines in the second quarter. The Burlington Township defense is all over Highland’s Javon Randall in the second quarter. Highland (6-1 and ranked No. 5) was able to grind out yards for most of the game and rode a 32-carry, 152-yard performance by sophomore running back Johnny Martin. Martin led the Tartans on several long drives that ended either empty-handed or with a field goal thanks to an inspired effort by the Falcons defense. It was those field goals — instead of touchdowns — that ended up being the difference. "The defense came to play," Maderia said. "I thought we matched their physicality."